This Saturday, 8/25, the 5th annual Vegan Soulfest comes to Clifton Lake Park in East Baltimore. Featuring speakers Dr. Milton Mills and Tracye McQuirter from the infamous documentary, “What the Health,” cooking exhibitions featuring RBG Fit Club's Afya Ibohmu and a musical performance by Grammy winning recording artist and vegan, Mya. 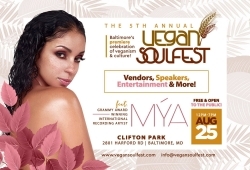 Baltimore, MD, August 23, 2018 — Vegan SoulFest 2018, presented by Yelp, is scheduled for on Saturday, August 25th from noon-7 p.m. at Clifton Park, 2801 Harford Road in Baltimore. This Saturday, August, 25th, over 150 vendors, speakers from the documentary “What The Health,” cooking exhibitions and musical performances by Baltimore's hottest, local artists and headliner, Mya (who happens to be vegan), plan to attract more than 10,000 attendees from the west, mid-west and south United States to the annual festival. The lineup of speakers and exhibitionists include Dr. Milton Mills (What the Health); Tracye McQuirter (By Any Greens Necessary); John Lewis (The Badass Vegan); and Afya Ibohmu (RBG Fit Club). Live entertainment includes vegan DJ Tee Brown, Baltimore’s own national recording R&B artists, Ruff Endz, soultress Ama Chandra and The Fruition Experience and hip hop rock star, Femi Drifish and The Out of Water Experience. The inaugural Vegan SoulFest turned out to be more successful than the founders imagined. The expectation was to attract a few hundred people to a free festival about food. Instead, more than 1,200 people attended, resulting in coverage by Dan Rodricks of The Baltimore Sun who described it as a “new food festival in Baltimore.” People came from all over Baltimore City and the surrounding counties – even as far away as Philadelphia, New York City and Northern Virginia – to learn more about the nutritional benefits of including more plant foods in their diets. They heard lectures from experts in plant nutrition and watched cooking demos on how to prepare plant-based foods from local vegan chefs. Best of all, they got to sample a variety of delicious vegan foods from dozens of vendors. In 2016, Vegan SoulFest attendance nearly doubled again, bringing out close to 6,500 people. In 2017, it's final year at BCCC, Vegan Soulfest entertained over 10,000 attendees. The annual “all vegan, all soul,” “vegansoulicious” festival continues to grow each year. For more information about the festival, please visit the Vegan Soulfest website at www.vegansoulfest.com. Vegan Soulfest is a registered trademark and collaborative effort between Thrive Baltimore and The Land of Kush.